This is a follow up to an earlier post, "Congratulations Reaching #1 in Google, Nadia" about the on-site SEO updates we did for a client that put it in the #1 position on Google for her most-searched keyword ("Los Angeles makeup artist"). The most import takeaway from that post isn't what we did to improve SEO, but why we did it: To help her visitors and meet her business objectives. Just by making the site more informative for her users and explaining the benefits of her professional makeup services we were able to demonstrate to Google that her site is a valuable and authoritative resource on that topic. 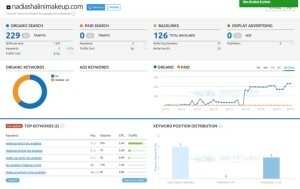 SEO Update Results: More Traffic and Sales! In the months since the SEO improvements - and this includes adding a lot of new content - the SEMRush data show more traffic to the site and our business owner client is reporting more calls and appointments. We love it when a plan comes together! Do you need new content or to have your website updated? We can help! Followup: See the traffic increases that resulted from this SEO update! Ok, the headline's a bit of a #HumbleBrag because Nadia's our client and we just updated her website. Also, be sure to see the very bottom of this post for the most important SEO factor in any website update. 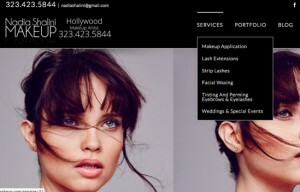 Nadia’s site nadiashalinimakeupartist.com is currently in the top position in Google for the search term, “Los Angeles Makeup Artist” - up from a previous position on page three! With her site appearing in the #1 "organic" positionit means she's seen above her competition in the most visible places - Yelp and Google Local. Google Local being the list of company names, addresses, phone number with pins on the small Google Map at right. “Makeup artist LA” is the top keyword term for her category and being in the number one "organic" spot (top listing that's not an ad) means she's getting the majority of clicks from people searching that term. Use of related keywords - not just "makeup artist"
No "keyword stuffing"! The one thing we didn't do was use the phrase, "makeup artist Los Angeles" all over the site. We did add it in a few places, where appropriate. All of the changes were done because they needed to be done for various customer service and business and marketing purposes. She added more pages with detailed information about her services to help her visitors get more information before booking an appointment. We added copy about neighborhoods in LA she works in to help people doing local searches. And site speed was increased to make sure people didn't surf away while waiting for the site to load. Because she works in show business in Hollywood, the portfolio on her site has a lot of high resolution images that created more page load challenges than a typical site. Part of her site update included fleshing out her makeup services from a one page listing to one page for each of the services she offers. This gave us a great opportunity to use a variety of related terms and concepts on her site. Most of the new pages are are decent search terms of their own, like "bridal makeup" and together they support "Latent Semantic Indexing" (LSI) that is part of how search engines like Google understand a site. Latent semantic indexing or analysis is just a fancy way of saying some words and phrases go together naturally. 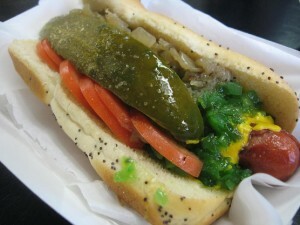 An example of LSI might be, if your site is about hot dogs, it would be normal to also see words like "ketchup", "mustard", "buns" and maybe "Coke" or even "baseball" or "summer" on the site as well. It used to be when you got to number one in Google, you were there nationwide, for all searchers. So there's no resting at the top and the Humble Brag we started out with is a little diminished. Although traffic is still usually better when you're at the top, the most import aspects of this site update are that they were done to help her customers and help her business. The fact that Google took notice of Nadia's site and presented it first as a relevant resource supports the idea that doing what's right for your visitors and business is the best SEO strategy. What’s the difference, how do they work together? When it comes to content and SEO, SEO is the framework and content fills in the body. A good SEO campaign uses pre-planned content to meet the goals of the shopper, the company and the SEO campaign. Include blog posts, articles, guest posts or social media that address these questions using the words and questions searchers have. Content marketing is talked about like it’s one strategy, but creating and sharing content is really part of several online marketing strategies. Content also educates your prospective customers as they search for information through the Consumer Journey or Purchase Funnel – as they go from looking for a solution, to comparing specific brands and options. Therefore, strategic content has to cover a broad range of uses. Content is like gasoline - you can put it in many vehicles depending on where you want to go and the type of ground you want to cover. How Does Content Work in SEO? Good SEO uses content in all of the examples above. As you plan your SEO campaign, think about what and how you need to communicate to your audience to lead them from discovery of your service to sale. Planning your content can involve a Content Calendar and you can also tie your SEO to the seasonal or promotional timeframes and events in your content calendar. It’s best to pre-plan for all customer shopping/buying phases and time of year promotions. This way you’re laying a blanket of SEO-optimized content that can be discovered by the right person at the right time. 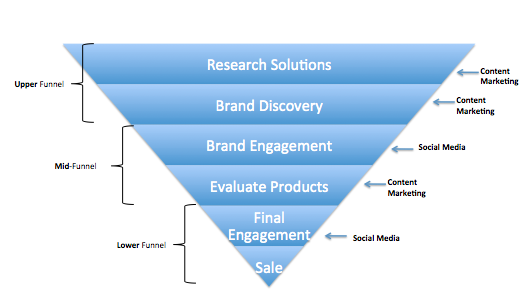 As you can see, it’s important to think ahead and create content for each steps of the consumer journey. Initially people might not know your product exists, they might just be looking for a solution to their problem. As searchers get educated you’ll want to explain why product is superior to your competitors. When it comes to making a sale, you might need to have special promotions (often on your website sales page) to push people to buy from you right away. It’s also important to consider your company’s needs when creating content. You have your own cycles and sales needs to consider. When creating content for an SEO campaign, which will roll out topics month after month, it’s best to think ahead and create content to cover all these bases. As part of a separate Content Marketing campaign, your company might create and release content just in time to address these needs. However, in SEO you want to cover all bases and have it sitting there for when the right person comes across it at the right time. The final part of content and SEO is the fact that your off site content being shared in the SEO campaign will link back (or have “backlinks”) to the content on your website. But even in the examples above, content plays a part. For example, SEO is based on getting your site noticed for keywords where you want to be seen by the searcher. In this case, after you select the keywords content will need to be developed – off site and on-site – to support the keyword a searcher is looking for. As you can see, good SEO relies on the creation and use of content in a big way. About the Author Pete Semple is a strategic marketing planner with SEO planning, SEM, Social Media and Content Marketing experience. He has 18 years experience helping small and medium sized business, startups and entrepreneurs meet their marketing goals. He is the owner of Right Hand Planning marketing consultancy. Do Seo And Backlinks Still Work? We've written about the rank tracking before (and there are affiliate links in here, thanks for helping us enjoy our Peet's Coffee - Major Dickason's blend, mmm!) and we're mentioning it again because it's important to track what's working so you know where to direct your efforts. The above email comes to us thanks to a great rank tracking plugin (only $27). Do Google Ranks Still Matter At All? Google rankings are not an absolute like they used to be. If you get a notice like the one we got above, it doesn't mean that's what everyone will see. Google search results have become quite nimble and now include many factors when deciding which results to present to a searcher. The rankings a searcher sees vary by variables like location, browser search history and other things. And this is fine. In fact it's great from a user point of view because accuracy and relevancy are what make Google number 1. There's no need to worry about these new variable search results. Yes, your rankings will not be the same in searches all over the country. But if you follow Best SEO Practices (write quality content, connect with people in your field, put all the right signals in your on-site SEO, etc) you'll notice you're getting traffic for the terms you want. If you spread quality content in places related to your line of work where your potential customers gather, you'll get very high quality traffic from those sources and won't have to worry so much about Google rank. AND your Google rank will probably improve anyway for having a natural profile. Do you agree? Or do you think we've missed something important? Let us know below! Last week we made a small business website in SquareSpace 6 for Sara a manicurist who works in a nail salon in southern Florida. It's easy to set up important SEO optimization settings in SquareSpace in urls, page names and meta descriptions. SquareSpace gives you a free yourdomain.squarespace.com domain but for marketing and SEO purposes, we went with a domain from NameCheap and set that as the canonical (preferred) domain with Google. SquareSpace automatically generates a Sitemap which we added to Google WebMaster Tools and viola! the site was complete and the next day all pages were indexed in Google search results. Our client selected the Comprehensive Local Marketing package to help her site appear in the local business listing listings in her area. This package uploads all the data about her business, including her phone number, address and website, into several databases that serve hundreds of website and smartphone directories. These listings give her site extra visibility in local business listings as well as add important backlinks that help her site rank organically in her keyword's search results. InfoGroup InfoGroup's point of interest (POI) data is used by the top 5 internet search engines, 90% of in-car navigation systems in North America, mobile navigation, GPS, and internet yellow pages. Acxiom Acxiom's InfoBase data powers internet yellow pages and local search applications. Companies like Google, Superpages.com, Local.com and Yellowbook look to Acxiom as a primary source for listing information. Dun & Bradstreet D&B is the world's leading source of commercial information and insight on businesses. D&B's global commercial database provides quality business information that customers rely on to make critical business decisions. Compass Compass offers comprehensive and accurate information on U.S. businesses to websites like LinkedIn and Facebook, mobile companies like Nokia, and credit bureaus like Equifax and Experian. Factual Factual provides access to definitive, global data to power web and mobile apps. Thousands of mobile apps and websites use Factual's data, including Booyah, Foursquare, and Trulia. nSphere nSphere powers local search on over 500 niche vertical directories like Car and Driver, Computer User, Dogster, EZTrader, Fathers.com, Golf Week, JD Power, Kiplinger, Outdoor.com, and many more. After a few weeks, her site was showing in these important local directory listings. Sara had in mind a site she liked that was made with SquareSpace and while we usually use Wordpress, we dug into SquareSpace and made her a nice site. SquareSpace is a very easy site building service to work in. It takes some getting used to when used to working in WordPress, but here's one thing I like about it - there are no updates. SquareSpace keeps the backend running so there are no Plugin or WordPress updates every time you login! It's not free, but neither is WordPress.org because you still have to buy hosting. The lowest tier service which was fine for our client Sara is $96 a year. At $8 a month, a bargain. WordPress has MANY plugins that markters and webmasters have come to rely on. Also WordPress has many more theme options than SquareSpace, so we're not going to abandon WordPress overnight. However, SquareSpace is easy to use and makes good-looking website with SEO e-commerce and code-ediitng factors built in so it's definitely a worthwhile tool for some jobs. Can A Site Rank Well With Few Backlinks? Today we'll put the spotlight on ourselves to share with you why we think we've managed to rank pretty well on a few key search terms even though our site (this one) currently has very few backlinks. BTW, more details on these topics and more are covered in depth in our (free) DIY SEO Guide. "This is why it's so important to' always be answering the searcher's question' when making pages and writing headlines and content." We don't have many backlinks yet because our site is still new and we're using social media and content sharing links for a gradual and natural backlink strategy. Also, we know we're likely to make some changes to site structure and blog categories before our structure is finalized so we want to avoid using too many redirects or linking to moved pages. In the picture above you can see that 11 out of 15 of the keywords appear in the top ten search results on the first page of Google. Most of the the keywords we're ranking for are related to our niche, which is a Los Angeles based marketing and SEO company so these are definitely the keywords we're going after. Since there are few backlinks to the site in general and to these pages we know that it's not strength of authority links that are bringing these pages of our site to the top of the search results for these keywords. "How to find local search terms" and "Press release topics" from the list above are two perfect examples that show how just by matching your on-site content and URL to match search phrases tells Google that your page matches the searcher's query. Competition for good keywords and their Google search traffic is fierce, there's no question about it. Use these little known SEO tips and tricks to get your pages (not site!) ranked for very relevant searches. Yet there are so many long-tail phrases (4 and 5 words) that can be used to put your page on the first page of Google. Long search terms are huge opportunities that other people don't think about because they're too busy going after the keywords with 2,000 and more searches a month. The trick is to write in the form of a question - a searcher's question. 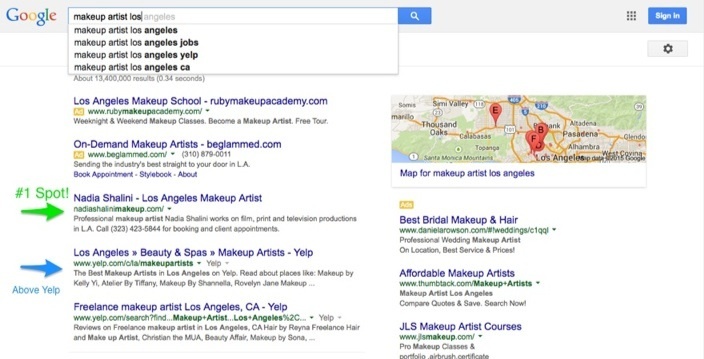 Write using the exact search phrases people are likely to use to search in Google. Keep the searcher's phrases in mind as you write url, blog topic and on-page headlines for each - and even in the sentences. Take a look at this blog page title, the url and the headlines and content to see how we've used phrases that could easily be searches of their own. Notice how all these phrases-turned-headlines could be actual searches? But no one would ever optimize an entire page for them because keyword traffic tools wouldn't show that there were many searches for these terms. Why does this work? Because "Google rewards relevancy" and they're very good at scouring all elements of a site and the more words you match in order you can score points for, even without backlinks. Still not convinced? Go back to the photo of the search results and the top ten rankings at the top of this post and read the searches and the URLs of the pages and the positions they were placed on Google for that search. Don't just write for Keywords - Maybe you've heard this advice while researching SEO techniques, that you should write for readers too. These methods do both! When a reader scans the headlines and sub-heads in this article they're likely to see topics that match their questions - these are likely to catche their eyes and get them to stick around to read more. Optimize your Page or Post title, the URL and the a major headline in your content for a search term to optimize it for the entire page. Also use this phrase in the Meta Description for the page to reinforce it further. Even without backlinks, this will send strong messages to Google about what your content is all about. We're not an "Authority Site" (yet). An example of an authority site is The New York Times. If you get a link from them Google notices. Authority sites are powerhouses on the internet that can give you a big boost if you get a link from. But what our evidence show is that if you match enough of the searcher's intent, even without backlinks from low-level or authority sites you can still have a page of your site appear as a viable option for the searcher's query. This is why it's so important to always be answering the searcher's question when making pages and writing headlines and content. Finally, the goal of getting ranked for specific long tail searches isn't just ego or glory or tricking Google - it's because you page is actually answering the question the searcher is asking - you can't ask for a better visitor to your site! Get Instant Site Rank Notification - Receive an email when your site ranks for a new term in Google. This rank tracking Wordpress plugin is $27 but it's been well worth it for us to know exactly how and when our SEO is working, know new terms we rank for to get new content and build a powerful FAQ list. Know instantly when and how a searcher is finding you. To increase your visibility in local search results, including in smartphones and GPS, see local marketing options and follow these links for local SEO and national SEO services.